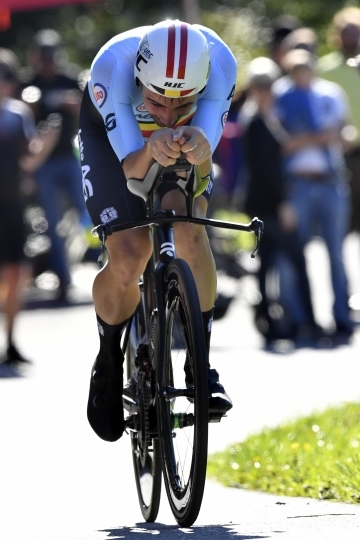 INNSBRUCK, Austria — Rohan Dennis has finally won the only major time trial title lacking from his long list of victories. And he has done so in style. 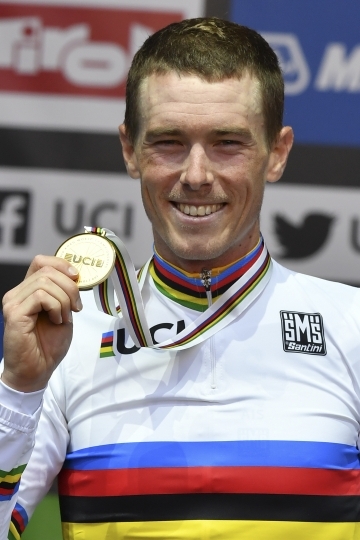 The Australian rider won gold at the road world championships on Wednesday, dominating the 52.5-kilometer race to beat last year's winner Tom Dumoulin by a massive 1 minute, 21.09 seconds. Victor Campenaerts, who won the European title in Glasgow last month, was 0.53 seconds behind in third. "I can't really explain it, it's an amazing feeling," said Dennis, who has won time trials in all three Grand Tours, including one in the Giro d'Italia and two in the Vuelta this year. Dennis had won gold in the team time trial with the BMX Racing Team in 2014 and 2015, but was still after his first individual world title. "It's a dream come true," he said. "I have been chasing this since I was a junior. I have never won it in any age group, so to win the first one in the seniors is very special." The course through the Austrian Alps was rather flat for the first 30 kilometers, until a five-kilometer climb from Fritzens to Gnadenwald with an average gradient of 7.1 percent. Dennis was the fastest from the start. 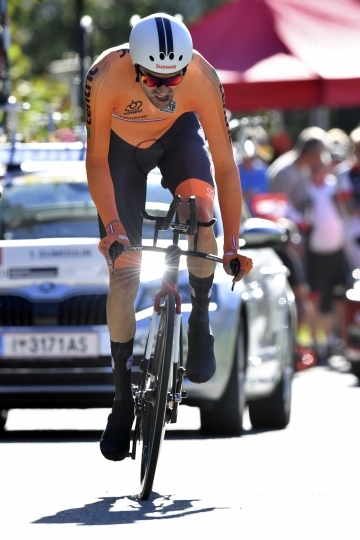 He already led Dumoulin by nearly nine seconds at the first split after 16.5 kilometers and built on his advantage in the steep second part of the course, where he increased his advantage to just over a minute. The defeat left Dumoulin in disbelief, and he shook his head several times while staring down on his bike after he crossed the line. It was his second silver at these worlds, after a runner-up finish with Team Sunweb in Sunday's team time trial, which was won by Quick Step. Dennis and Dumoulin were widely regarded as the gold favorites. The Dutchman beat Dennis in the opening stage of the Giro, but Dennis won a longer time trial later that event. 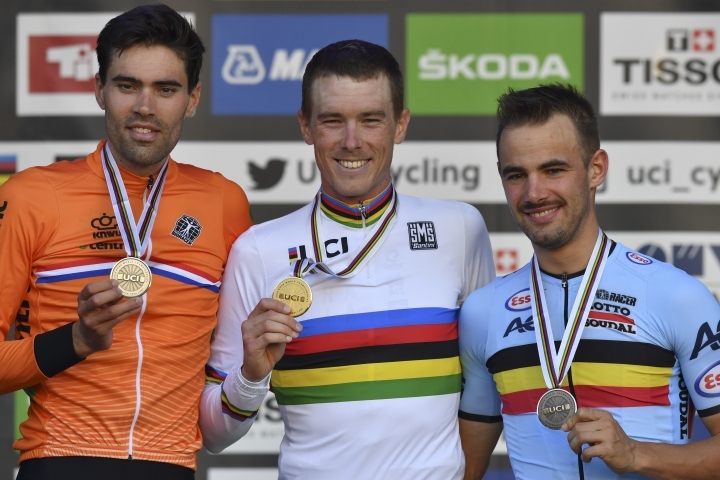 While Dumoulin took a break from racing after finishing second in both the Giro and Tour de France, Dennis used the Vuelta as his preparation for the world championships. 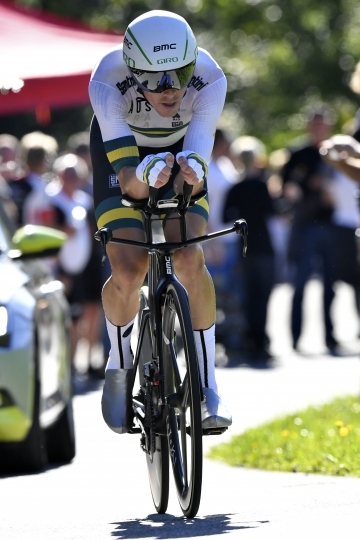 The victory made him only the second Australian to claim the world time trial title, after Michael Rogers won three straight from 2003-05. Trying to match that feat was not on his mind, he said shortly after finishing. "I am just going to enjoy the moment, and enjoy the next year in the rainbows (jersey)," Dennis said. The road races at the world championships take place this weekend, with the women competing on Saturday and the men the following day.